KNOXVILLE - HP Patel and JT Patel love Knoxville. 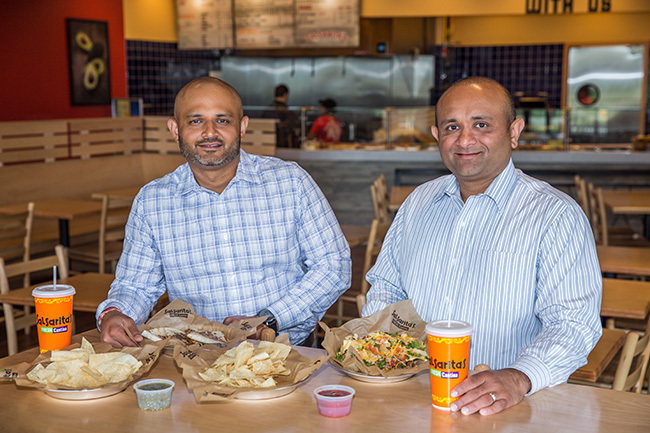 Since 2004, the brothers have owned and operated LAXMI Ventures, which will now open its 11th Salsarita’s Fresh Mexican Grill in Knoxville. They opened Number 10 in Morristown at 140 Hatfield Drive on July 24, 2017 and Number 11 is located at 7614 Chapman Hwy, Suite 124. Two more locations are planned to open in Knoxville in 2019 The popular fast-casual Mexican restaurant dominates a market where there are Chipotle and Moe’s Southwest Grill locations as well and HP Patel is proud of that fact. A native of Gujarat, India, Patel came to the United States in 1991 at age 15 where his family settled in Knoxville. In 1998, Patel graduated from the University of Tennessee with a bachelor’s degree in retail management. Shortly after graduation, he moved to Charlotte to pursue his own small business endeavor and got a job managing a UPS Store from 2002 to 2004. This is where he got introduced to the franchise business model. Patel changed his business strategy when he learned franchising was a team sport. He liked it enough to go on a search for the perfect fit for a franchise that could become a family business; one he could go take back home to Knoxville and create a foundation for growth. After much research into various concepts Patel settled on Salsarita’s Fresh Mexican Grill based in Charlotte, NC. The chain, headed up by restaurant industry legend, Phil Friedman, offers Mexican favorites such as five flavorful house-made salsas, custom burritos, tacos, nachos and salads made fresh to order with an extensive selection of proteins, toppings and fillings. Salsarita’s Fresh Mexican Grill offers Mexican favorites such as five flavorful house-made salsas, custom burritos, tacos, nachos and salads made fresh to order with an extensive selection of proteins, toppings and fillings. Salsarita's was acquired by franchise industry veteran Phil Friedman in 2011 and operates more than 81 locations in 18 states, including 13 that are company-owned. For more information, visit www.salsaritas.com, visit on Facebook at facebook.com/salsaritas and follow on Twitter and Instagram @salsaritas.